A small bathroom can still be a real asset in the home as long as it’s designed as intelligently as possible. Few things make a house more attractive to buyers than beautifully designed practical spaces like the kitchen and the bathroom, but even when you aren’t thinking of selling, it’s important to have a lovely space where you can go through your daily routines. For starters, you need to make the room seem bigger than it actually is. This is something you can do by manipulating light. The bigger the window the better. When you have lots of naturally light pouring into the room and less wall space to create shadow the room seems loads bigger. Plenty of bright, practical spotlights are a good idea and it’s best to go for white tiles and white bathroom suites because they are reflective brighten up the whole space. Naturally you’ll have a bathroom mirror over your sink, but it might be worth getting more mirrors to reflect more open space if white tiles aren’t performing the reflective task well enough on their own. You’ll inevitably have to store a number of items in the bathroom, but you need to actually limit the number of items of furniture you employ to do the job. Be intelligent with your storage. You need a bathroom mirror and a bathroom cabinet, but you can conflate the two by having a cabinet with mirrored doors over the sink. The sink unit itself can provide vital extra storage underneath it too. In the shower, make use of the wall space so that you can keep everyday items in there. As for towels, a simple stand will do so that you can roll them up when they’re not in use. Towels that are in use can be hung on free walls and on the back of the door. Don’t plump for a shower unit and a bathtub if it’ll put too much pressure on the space in your bathroom. Simply install a shower unit over the bath and invest in a nice screen. Completely transparent glass screens are best here because don’t intrude on the room – the don’t create an opaque division that makes the place feel cramped, but encourage the flow of lighting around the room. 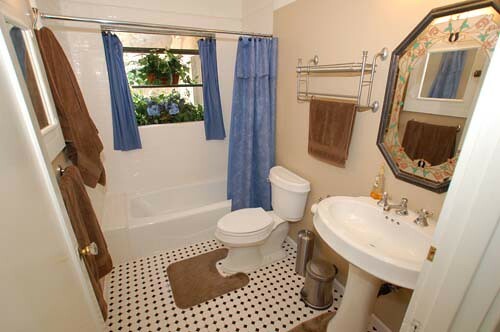 The more ornamental features you have in your bathroom, the more likely you are to suffer space issues. Keep things simple. If you have a corner unoccupied by other furniture – perhaps the corner over the bathtub on the opposite side to the shower head – put some neat little corner shelves, preferably glass ones, so you can put a couple of candles up for atmosphere. If you’re worried about colour, a couple of accent tiles to break up the white here and there will do the trick and you can bring more with your choice of bathroom linen.